Eliza Vitri Handayani at Frankfurt Book Fair, in conversation with literary scholar Asri Saraswati and writer Zen Hae. Indonesia is this year’s Guest of Honor at FBF. 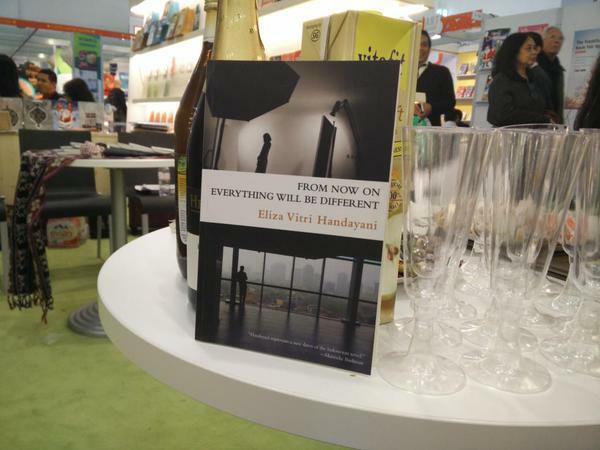 Zen Hae: Welcome to this event celebrating the launch of Eliza Vitri Handayani’s novel From Now On Everything Will Be Different. We will have a reading and a short discussion, followed by a reception. My name is Zen Hae and I’m here to introduce Eliza and Asri Saraswati, who will be hosting the discussion. Eliza was first published when she was still in high school. Her novella was serialized in Horison literary magazine. She developed the novella into a novel, which came out in 2003. And now she is here to launch her first English-language novel From Now On Everything Will Be Different, which is a longer version of her Indonesian novel Mulai Saat Ini Segalanya Akan Berubah, published in 2014 by Obor. Asri Saraswasti is a PhD Student at the American Studies Program, Transnational Studies Department, University at Buffalo, State University of New York. She is a Fulbright scholar with particular interests in literature by Indonesian community in the US, memories of migration and trauma, and Indonesian literature in a transnational framework. Prior to enrolling at UB, she worked as a faculty member at the English Department, University of Indonesia. Welcome, Asri, I’ll hand the event over to you. Asri: Thank you, and welcome everyone. I first learned about Eliza’s writing when I was still an undergraduate. Professor Riris Sarumpaet told my class that Eliza’s first novel was very interesting and had just won a national award. Now I’m very excited to share with everyone about Eliza’s second novel From Now On Everything Will Be Different. The novel is about a love story between the two main characters—Rizky and Julita—set against the backdrop of Indonesia 1998 and early 2000s. Here at Frankfurt Book Fair we have been hearing a lot about how Indonesian writers are talking about 1965, and Eliza’s novel adds to that, it tells about another very important point in Indonesian history as it captures the moment when Soeharto—who led the authoritarian regime called the New Order—had to step down from his government and we entered a new phase called Reformasi. The novel tell the story of a medical student who is in love with his friend, a rebellious photographer, and we readers are taken into the adventures of these two characters and into their friendship. As the nation struggled to determine what Indonesia should look like in Reformasi and beyond, these two character were struggling to determine what they wanted to be. More than just a love story, this novel is very smart with a very interesting structure, going back and forth in time and mixing epistolary form of emails and text messages with chronological narration. I think this novel gives a fascinating introduction into our—Eliza’s and my—generation, who experienced 1998 and are still trying to make sense of what happened and what we want to be in the future. Now Eliza will read an excerpt to give the audience a taste of her novel. Asri: Thank you, Eliza. Now we’re open for Q&A. Would anyone like to comment or ask a question to Eliza? Actually I’d like to ask a question first. Your novel talks about 1998, what motivated you to write about ’98? How did you yourself experience ’98? Eliza: I was fifteen at that time and shut away in a semi-military school in Central Java, so I didn’t get to experience first-hand most of the student protests, the riots, and the arsons. The school didn’t let the students watch the news or read about what happened until Soeharto had stepped down. When I came home to Jakarta, I did see the traces of what had happened—the malls and supermarkets where my family used to go shopping had been burned, I saw many writings spray-painted on shops’ walls ‘Do Not Attack, Owned by Native Indonesian Muslim’, and of course I heard many stories about women being raped and activists kidnapped. I am very interested in ’98 not only because it was a turning point in Indonesian history, but also because of what it meant for the individuals—people like Rizky and Julita. As Rizky said in the story, it was our chance to finally be able to come out of hiding, to express our mind, politically or otherwise, to think more freely and to try to live our life as honestly as we can. It’s also about restoring our dignity, about us having a say in the governing of our country and our lives, and us being able to tell stories that are true about who we are, where we came from, and what we want to be. Asri: How long did it take you to write the novel? I see that there’s a lot of research in it, you mentioned things that happened not only during the student protests, but also what happened on campuses and the events surrounding the protests. Some were quite detailed. Eliza: I think it was about three years. Well, the story existed before as a short story focusing mainly on the love story between Rizky and Julita. In the beginning I wanted to write about a man and a woman who had very high artistic aspirations, but they kept coming up against obstacles and they kept failing, and I wanted to see if they would choose to keep their aspirations alive or to move on to other dreams. Then it occurred to me that it—high hopes followed by a series of disappointments—was also what happened in Indonesia after the start of Reformasi. We had this great momentum and we thought yes, from now on everything will be different, but then we realized—and my characters did too as they grew up—that things weren’t gonna be that easy. I thought I could marry those three strands, what was happening in Indonesia and what was happening to the characters in their professional and personal life, to tell a story about breaking free, be it from a repressive regime or from blindly practiced norms, and from what seemed to be fate: this pattern of repeated disappointments, even from who you were. I mean, can you choose what kind of person you want to be, or is who you are also determined by things beyond your control, such as your genes or upbringing or social environment? Can you choose to be someone new? About research, I went to the National Library in Jakarta everyday and read periodicals from that time period—news magazines, women’s magazines, teen magazines—to get a more complete picture of what life was like in those times, what people wore, how people talked. I wanted to be thorough, but I also tried to be selective. I wanted the historical background to really add to and reveal something more about the story and the characters. Asri: I see now there’s a question from the audience. Audience: I was wondering if your novel also talks about the trauma experienced by the victims of 1998? Asri: Your question brought up an important point, because I think another interesting thing that Eliza talks about in her novel is the issue of mental illness, and how the characters struggled with depression, confusion, and self-harm. Mental illness is something that we fear in Indonesia, we know people experience it, but we don’t know how to handle it. We don’t know how people go through it. I think that’s another thing that’s very interesting about this novel—how mental illness can be a part of life. In this novel, Julita went to see a psychiatrist and was told to pray—but that doesn’t really help, does it? So dealing with trauma and mental illness is another interesting theme that this novel brings up. Another question? Audience: Very nice story. I was there in 1998, at the university, I know many victims. I’d like to ask about the message of your book. Is there a message for our young generation, whether they were involved or not directly involved in the ’98 protests? Should they want to be involved in Reformasi efforts? Eliza: I wouldn’t say that the novel has a direct message. I don’t like my books to have explicit messages, because I don’t think that’s what novels are for. I think readers can gain a lot of support and comfort and encouragement if they find something in stories that relates to their situation, but… I try to draw parallels between Indonesia’s struggle for democracy and the characters’ struggle to realize their dreams to explore the question of how we can break free from whatever it is that’s shackling us: an authoritarian government, other people’s control over us, even our own fears. And how we can find ourselves and feel free to be ourselves, and how we can be loved for who we are. Perhaps that will inspire some readers to feel more safe and comfortable being who they are. Audience: A lot of things happened in ’98, in your personal opinion do you think what happened will make us stronger as a nation because we can learn from it, or do you think it will make us weaker because it will continue to haunt us like a nightmare? Eliza: After Bela told Julita about how she and her family were attacked in ’98, Julita came to see her father, who often said racist things about the ethnic-Chinese, and she told him Bela’s story. Julita hoped her father would feel some compassion and would change his racist opinions. Julita’s father said that he thought the Chinese had deserved the violence, and it really crushed Julita. Bela also talked about loving a Malay man, but her parents didn’t like her dating him and wouldn’t let her have pribumi friends. Yet Bela kept on seeing the Malay man in secret. I think my generation is more open to learning from painful tragedies in the past. As you know right now many young Indonesian writers are exploring and telling stories of the ’65 massacres. I also feel my generation is more accepting of differences, intermarriage, homosexuality… So there are reasons to be optimistic that it will make us stronger. Julita realized this as she returned to Indonesia—before ’98 she felt nothing she did could ever influence how the country was running, but after ’98 she thought that it was possible to try to change things for the better. I think this is one of if not the most important achievements of Reformasi—it’s not about making everything perfect, but it’s about giving us the tools, the legal channels, and the possibility to participate in government and to try to improve things. Asri: Any other comments or questions? No? All right, then I’ll close the event. Please now join us at the reception—we have sparkling wine and juice—and come get your copy and don’t forget to have it signed. Eliza: Thank you to Yayasan Pustaka Obor for having us here. Thank you to Zen Hae for the introductions. Thank you to Asri Saraswati for moderating the discussion. And thank you to everyone for your time and attention.